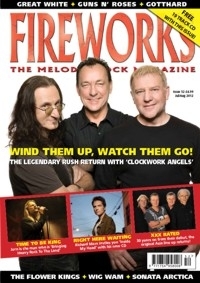 Fireworks Magazine offers another absolutely superb selection of features, as Issue 52 includes a double page spread on Canadian rockers Rush, as well as an informative interview with multi platinum selling singer/songwriter Richard Marx.We bring heavy rock to the land with the mighty Jorn, and spend time chatting to Geoff Downes of the original, reformed super-group Asia. We don't stop there either, as we also include interviews with some other names you might be familiar with… like Guns N' Roses courtesy of long standing member Dizzy Reed, Sonata Arctica, Gotthard and a candid interview with Mark Kendall of Great White. Of course, we could also tell you about the articles on Peter Cetera, Delain, Wig Wam, Firewind, Driver, Paul Sabu, The Flower Kings and a career retrospective of Bad Company's Robert Hart - but maybe you would be better off simply buying the new issue so you can enjoy the 34 interviews it contains at your leisure. We'll make it worth your while - there will be a FREE CD containing 19 tracks attached, and we include reviews of all the latest albums, DVDs and reissues so you know what's worth getting. All in 96 lovely glossy pages. Can't say fairer than that, can you? Fireworks #52 is out now! • Direct from Fireworks HQ by emailing [email protected], paying via Paypal. Send £6 (Inc P&P) for UK, £8.50 (inc P&P) for Europe, and £9.50 (inc P&P) for USA/Rest of World.